My parents recently bought the kids a lovely book called Rescuing Rhino. It is a very sweet children’s story about an orphaned rhino and how he was rescued by a vet and raised by the vet’s family. The story is lovely with lots of sweet bits like how the rhino got into the neighbour’s garden and ate all her flowers and how the rhino wanted to sleep on the children’s bed but he got to heavy and ended up breaking all the beds (my son thought this was the best a rhino sleeping on your bed). The fictional story is lovely but it is only part of the book. After the story there is a whole factual section. It starts with information about saving the Rhino, same stats and then a section on orphaned wild animals, how they are raised in captivity and then released again. I really liked this as it expands on the story. It is a brilliant way of taking a lovely children’s story and talking to the kids about some facts. The book is about an orphaned animal so in the fact pages they do talk about animals being orphaned. My kids did not find it too graphic but we have spoken about animals been hunted on numerous occasions before and they are fine with it. There is a photo of a dead elephant and a calf at her side as well as one of a rhino whose horn has been cut off (see below) but these are the only 2 images which I think highly sensitive kids might find sad. And then after the factual section there is an activity / craft section. This includes a footprint activity, some baking ideas and some fun crafts. One of our attempts at a playdough rhino. I really like this book as they have combined a lovely story with some information about wild animals and then they included some crafts. All in one book. Very impressed. And there are three other books in the series (so far we have two of the books). 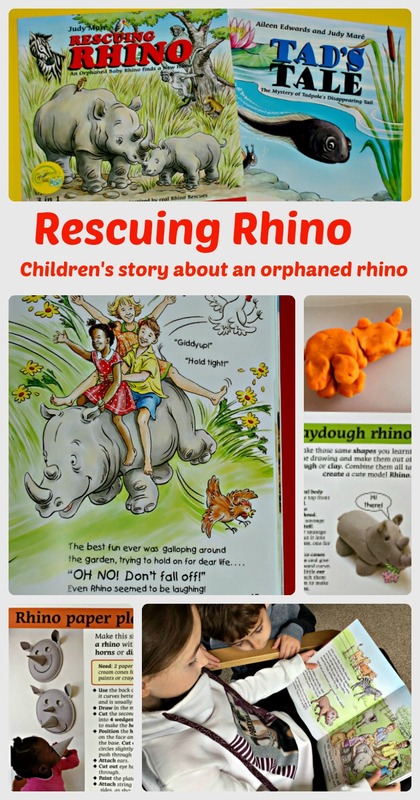 This entry was posted in Book Ideas and tagged african animals, animal books, children's book, home education, homeschooling, rescuing rhino, rhino, tadpole. Bookmark the permalink.